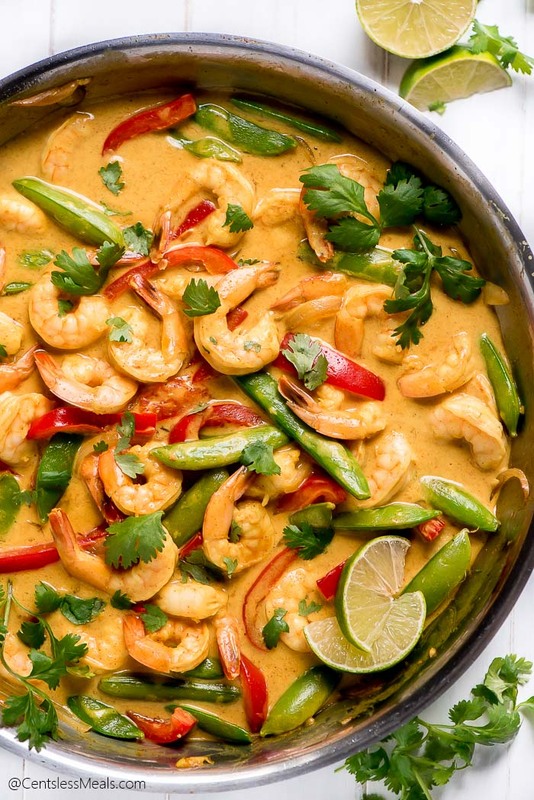 This flavorful Shrimp Curry in a coconut cream sauce is loaded with veggies and served over Jasmine rice. It’s the perfect 20 minute weeknight meal for the family! We’re getting to that busy and hectic time of the year with school, extracurricular activities, and the holidays so quick and meals like Slow Cooker Beef and Broccoli or this Shrimp Curry are a necessity. 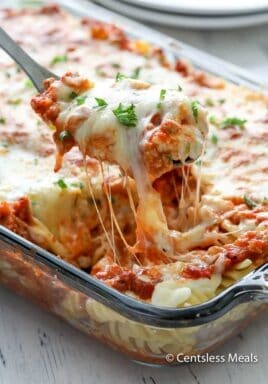 Delicious, easy, and filling – a meal the whole family is sure to love! I love Thai food! The food is so rich and flavorful and it’s great for making at home because it’s easy and comes together so quickly. Some of my very favorite Thai meals are Instant Pot Chicken Curry and Chicken Pad Thai. Like with any recipe, you should practice ‘mise en place”. It’s a French phrase meaning “everything in it’s place”. Have all your ingredients cut, measured, and ready to add to the pot. This not only helps make sure you cook everything the proper amount of time but it also is a good way to double check that you do in fact have all the ingredients needed. To begin, you’ll need to prep your shrimp. I prefer to buy frozen shrimp that already has the shell and the vein removed. It saves a lot of time so it’s worth it to me. (Remove the tails if you don’t want to have to while eating. I left them on for looks.) 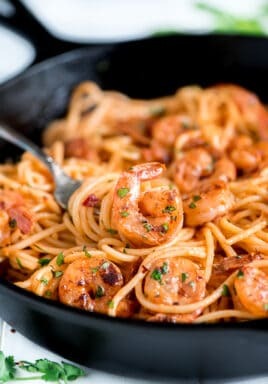 All I have to do is thaw the shrimp by placing it in a bowl of cold water in the bottom of my sink for about 30 minutes, switching out the water halfway through. Drain and then season the shrimp with the spices and lime juice and allow it to sit until ready to add to the skillet. Next, you’ll start cooking the veggies. You can use olive oil or really and type of fat you have on hand. 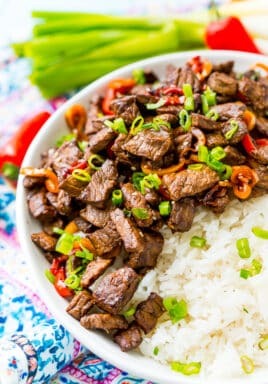 You’ll saute the onions for a few minutes and start adding in the red bell peppers, snap peas, garlic, ginger, and all the yummy spices like turmeric, coriander, cumin, and curry powder. 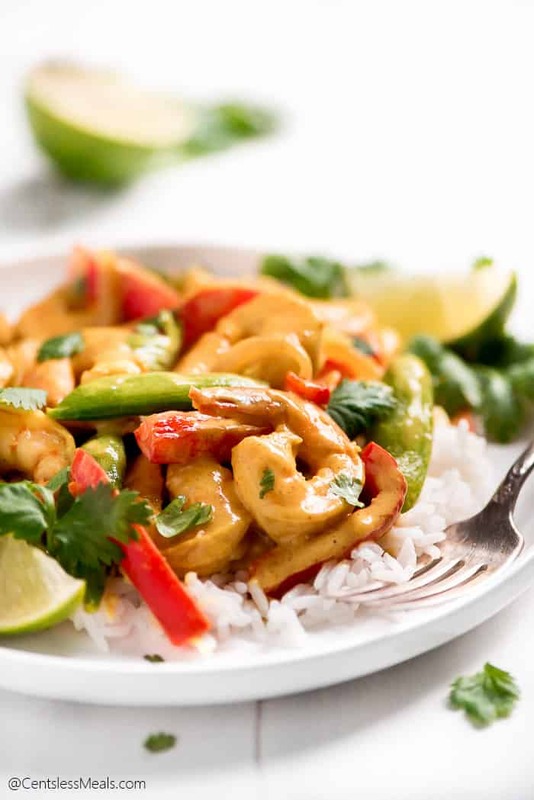 To make that creamy flavorful sauce you just need to add in a can of full fat coconut milk. Honestly, it’s not worth it to buy lite. It’s just watered down but you’re paying the same price. If you’re looking to cut calories and fat, just buy the full fat and water it down yourself. This will make your sauce thinner so you’ll have to compensate with adding more cornstarch to thicken it up. 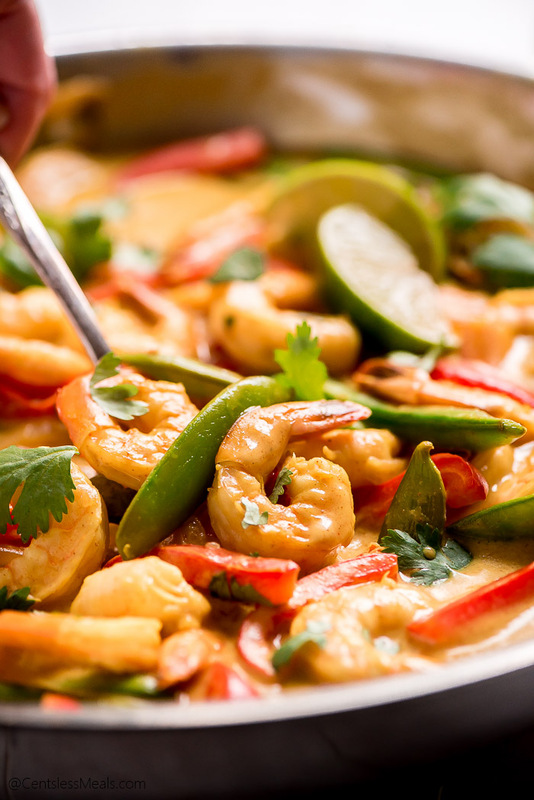 After adding the coconut milk, toss in the shrimp and bring everything to a simmer and cook until the shrimp is pink and cooked through. You can create a thicker sauce by mixing 1 1/2 teaspoons cornstarch with 1 1/2 teaspoons water, add it to the sauce and cook another minute. At this point you can also stir in a classic Thai ingredient- fish sauce. This helps round out the flavor and when paired with lime juice, the fishy smell is counteracted. Serve your curry over Jasmine rice (long grain white rice works too) and garish with fresh cilantro and lime wedges. Can I Make Any Substitutions? YES!!! Feel free to swap out the veggies for different ones you like or just use up the veggies you have hanging around in your fridge. Carrots, snow peas, sweet potatoes, spinach… all would be great in this dish. Asian dishes are the best because you can really load up on the veggies and use whatever ones you prefer. Enjoy! 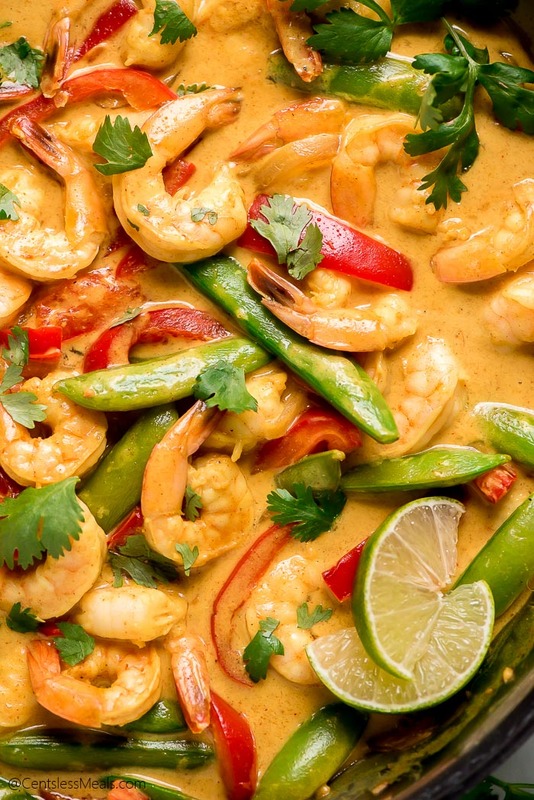 Save this Shrimp Curry recipe to make for a quick weeknight meal. Enjoy! 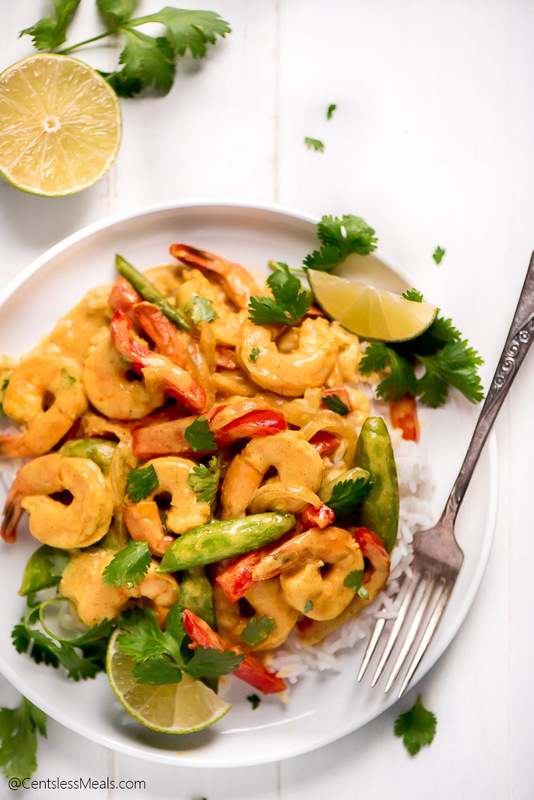 This flavorful Shrimp Curry in a coconut cream sauce is loaded with veggies and served over Jasmine rice. It's the perfect 20 minute weeknight meal for the family! Season shrimp with salt, pepper, cayenne pepper, and lime juice. Let marinate for 10 minutes. Drizzle oil in a large skillet and heat over medium. Add the onions and cook for 3 minutes. Add in the bell peppers and cook another 2 minutes. Add the sugar snap peas, garlic, ginger, and seasonings. Cook for about 30 seconds and then pour in the coconut milk and brown sugar. Bring to a simmer and then add in the shrimp. Bring back to a simmer and cook for about 5 minutes until shrimp is pink and cooked through. If desired, stir in fish sauce and for a thickened sauce, add in the corn starch water mixture and cook another minute. 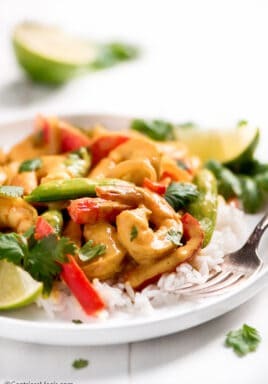 Serve curry over rice and garish with cilantro or thai basil.